Seekasong makes it a snap to find MP3s of songs that are topping the charts around the world. Top 20 lists of songs popular in countries like the US, UK, Canada, and Australia along with regional favorites let you quickly download MP3s of hit songs along with their lyrics and CD covers. If you're more of an independent-minded audiophile, you can also search by artist and title for more obscure songs. The most helpful feature of Seekasong is that you can see how many times a certain MP3 has been downloaded, which can help you weed through incomplete or fake MP3s. 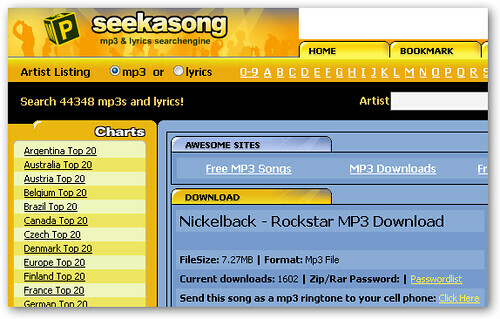 Seekasong also lists the most downloaded and last added MP3s which is often helpful in finding good songs. Check out our complete guide for more free, legal sources of online music.